Well...A LOT has changed since the last time I blogged about my pregnancy and I am finally sitting down to write the details of how our son's birth played out. I wanted to get the details down in writing as to never forget the miracle that Lincoln is! Obviously since my last post, our baby didn't have a name yet. Just 6 weeks after that last blog post, Lincoln arrived. I LOVED IT! I loved being pregnant. It was an amazing experience and I am so grateful that at times, when people asked me how I was doing, I would be hesitant to tell them how great and it all felt because I knew that's not generally the case for most women. I have been blessed to not have had any sickness, no weird mood swings - (although Matias may beg to differ), no weird cravings, and very little pain (other than lower and upper back pain in the third trimester). I was able to work out at least 4 days a week, hike on the weekends, and run between 6-8 miles a week. I had however experienced hoooorible exhaustion. Which was the worst because I was trying to manage my business full-time and finishing my master's program at George Washington University full-time. For food cravings, I dreamt about carbs and sweets, which is so not like me! I also had this intense burning sensation right under my chest as my belly was growing and the skin there kept feeling tighter and tighter. This prevented me from being able to eat a full meal because if I did I would get full after just a few bites. But all in all, everything was normal in body HQ and all my doctor's checkups and tests came out normal. Even the day leading up to Lincoln being born I was feeling just fine. June 23rd I was shooting a wedding all day with a friend, and I am pretty sure I was on my feet for over nine hours. Also, it was just a really busy day and I didn't hydrate and eat like I normally would at home. And photographers know this, shooting weddings is really hard on your body and you literally need a day to recover sometimes. So if I had felt any pain, I attributed it to being tired from the wedding. Anyway, I got home a little after midnight after enduring a long and painful drive. The moment my head the pillow I felt better. But, not even an hour had gone by and I woke up in so much pain. Thus started the beginning of my story. The pain came and went all night. I started to time it and it went from every 20 minutes to every 10 minutes. I wasn't sure what it was so I turned to google and based on the symptoms I thought it was either round ligament pain or Braxton-Hicks contractions. But then I got up to use the bathroom and noticed I was spotting, which is a HUGE cause for concern. So of course, I PANICKED! So many things went through my mind, one of which was "What the heck was I going to do about the wedding I was supposed to be shooting that evening...?" I got on the phone with my OB's office and the OB on call said I should come in. At this point, I did not think that I would be having a baby in just 24 hours, but my husband, Matias and I decided to pack a hospital bag JUST in case! We get to the hospital, and I am barely able to walk at this point so I get wheeled in to the labor and delivery floor. As soon as the nurses saw me they got me onto a bed and the rest is history. So many things followed my entrance to the hospital that some of it is all a blur. I remember the OB coming in, checking my cervix and telling me that I was 4 centimeters dilated and 80% effaced, followed by, "It looks like you will behaving your baby sometime between now or in the next few days...!" I was shocked, devastated, worried, and plain just disappointed. I felt like I had done everything right, so what was going on?!?! With the OB's prognosis, the nurses went to work very quickly to prepare baby's arrival. So many crazy things followed. As the nurses were poking me with needles trying to find a vein to hook me to an ivy, I remember getting on the phone with other photographers who could replace me for weddings I had to cancel on that day and the week after. The OB had me on magnesium, to space out the contractions further apart. The goal was to keep me pregnant for 48 hours, enough so that I would get shots necessary to strengthen baby's lungs for his early arrival. I couldn't eat or drink anything for 24 hours. I was also put on antibiotics because my white blood cell count was high, at which they suspected was I had some sort of infection. By 11pm, the contractions came back closer together again and they got terribly painful-- so did Matias' hands which I'd squeezed the life out of at that point. My OB knew I'd be delivering soon. Around 12:00am the next day, 06. 25. 2018, my water broke. There definitely is no going back from that. The pain was so unbearable I asked for an epidural. Epiderals work with gravity, and unfortunately for me the epidural had mostly gravitated to the left side of my body. Meaning that every time a contraction came, I would still feel it, but only on my right side. After shifting my body weight to get the epidural moving and even on both sides, it was already time to start pushing. 15 minutes later our beautiful boy, Lincoln, was born! He was so beautiful! The first thing everyone noticed about him were his lips, so plump! LOL. The whole thing felt like an out-of-body experience, so surreal. I was SO happy and at the same time SO sad, not knowing what the next stage of life would look like in this situation. Matias cut the umbilical cord and I was able to hold Lincoln for a few seconds before the doctors had to reel him to the NICU. Our Lincoln was born at 28 weeks at 12:57am on June 25, 2018. He weighed 2lbs 7ounces and measured 16 inches tall. We were so happy to have him here, safe and healthy, but scared as new parents with so many unknowns about his health and development. Thus began our 56-day NICU journey. 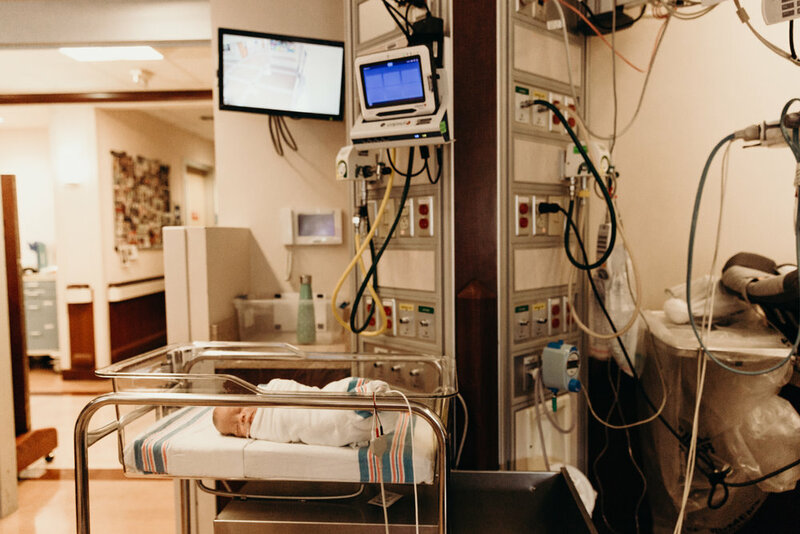 Soon after I was discharged, I remember feeling devastated leaving the hospital empty-handed, and that feeling never went away the following days we would make the daily trips to the NICU to see our son. It has been the most challenging situation both of us have ever been through. It was emotionally draining, physically exhausting, and mentally crippling. If any of you reading this has had a child in the NICU, then you know exactly what I am talking about. And here's what a lot you want to know: WHY? WHAT caused preterm labor?!? Well, once I delivered, the doctors collected the placenta and sent it to a lab. The cultures came back with findings that were consistent with acute amniotic fluid infection, an infection called chorioamnionitis. According to marchofdimes.org, this is an infection of the amniotic fluid and tissue that surround a baby in the womb. The infection causes contractions which can lead to labor. In some crazy way, the body's response to this and similar other infection is to get baby out immediately. For future pregnancies, I will have to be monitored by my OB very closely and placed on progesterone medication to prolong pregnancy, just for precaution. Never in my wildest dream did I think this is how my first pregnancy would go. But, it did. I didn't get far enough in my pregnancy to do my maternity photo shoot, have a baby shower (while pregnant), or nest and create the nursery that I wanted for Lincoln. Instead, Matias and I spent those precious last month of pregnancy at the NICU, going through the many highs and lows of the NICU journey. But Lincoln's here and we're so happy. We're both fine and healthy. That's what I keep reminding myself. We are amazed at how so many people reached out to us and showed us so much love and support during this time. We are extremely grateful to know you and to walk like with you. The way you have been there for us is something so powerful, it has made a momentous impact on our lives, one we will never forget. We are also so grateful for all the caring nurses and doctors at the NICU at the Inova Alexandria Hospital. Towards the end of Lincoln's stay in the NICU, they all felt like family. It was through watching them that I learned how to take care of our Lincoln. Lincoln has been home for a week and 2 days now and let me tell you, it's soooo wild!! We find ourselves happy, confused, in awe, and in tears, all the emotions! The best part is not having to drive to the hospital just to see our son's face, now he is always just a few feet away from us (when we're not smothering him haha). Navigating life as parents to a preemie comes with its challenges, but we are so blessed to have such a strong and healthy babe.. His life is a miracle, and a testament to the faithfulness of the amazing God we serve. Photo on the left: July 9, 2018. Photo on the right: August 21, 2018, Discharge day! !